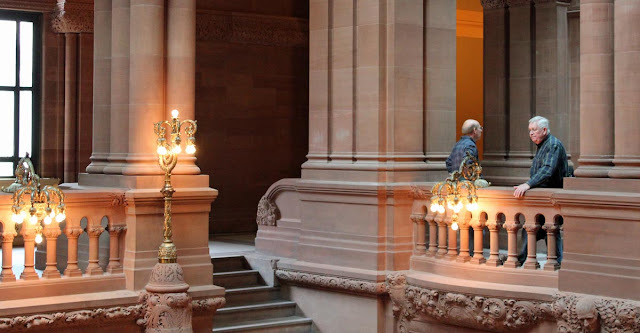 We walked through the New York State Capitol after our church experience. The capitol was built in the style of a French château (the design is reportedly based on Paris' Hôtel de Ville) and was completed in 1899. It's the fourth building to serve as the state's capitol and is one of ten American state capitols without a dome. The New York State Capitol at Albany seen from the top of Corning Tower. 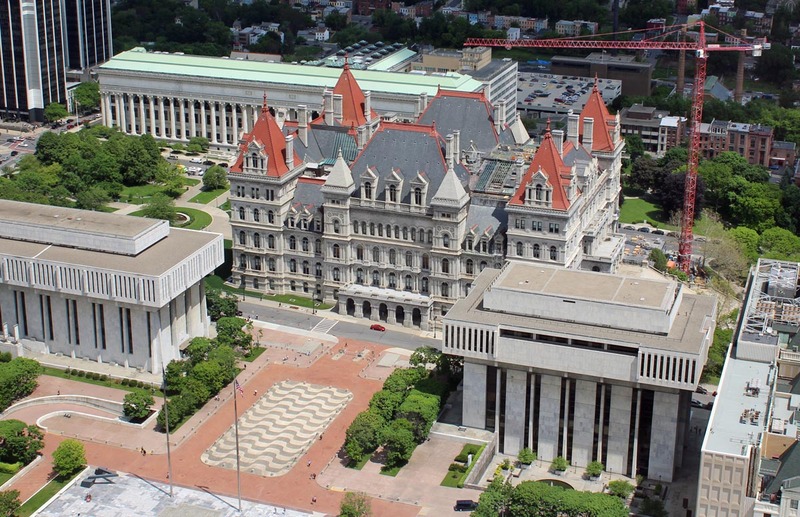 When I was seventeen and had my first state job, I would get off the bus on the north side of the capitol, then walk through to the south side and enter the tunnel to the Empire State Plaza's concourse and on to my office building. Walking through the capitol felt like going back in time, not only because of the building's age and design, but also because of the old-timey newsstands, shoe-shine stalls, telephone booths (for reporters and the public), and cafeteria that lined the north-south corridor at street level. 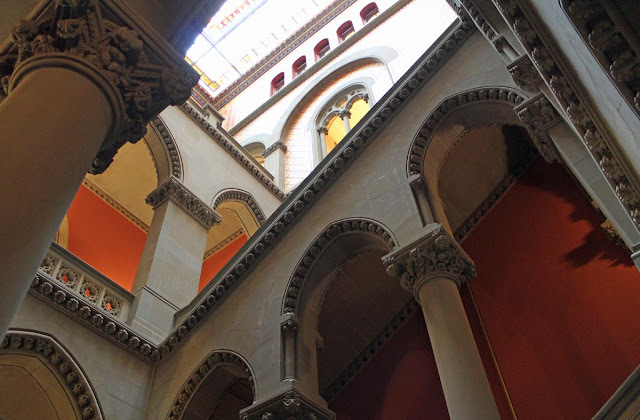 The north-eastern staircase, on the Assembly side of the capitol. Most of that is gone now, replaced with not-so-elegant security lines, metal detectors, and x-ray machines. The only security back in the old days were some rather jolly looking men in uniform. There used to be elevator operators in the capitol, too, also victims of modern times. The Great Western, or Million-Dollar, Staircase. Our little party wandered around the building, not wanting to take the time for a formal tour. We found our way into the eastern staircase and then to the Senate lobby. We got a peek into the Senate chamber as one of the formal tours was exiting. 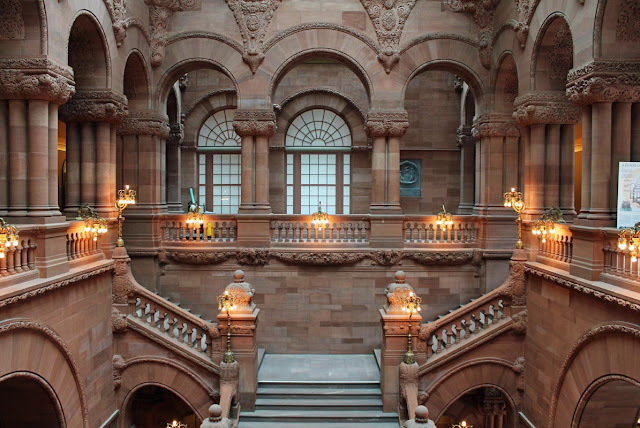 Then we made our way to the Great Western Staircase, sometimes called the "Million Dollar Staircase." It was quite pricey and controversial when it was built. The Assembly Chamber, seen from the western gallery. Finally we found the Assembly Chamber and the gallery was open, so we walked in for a look and some pictures. 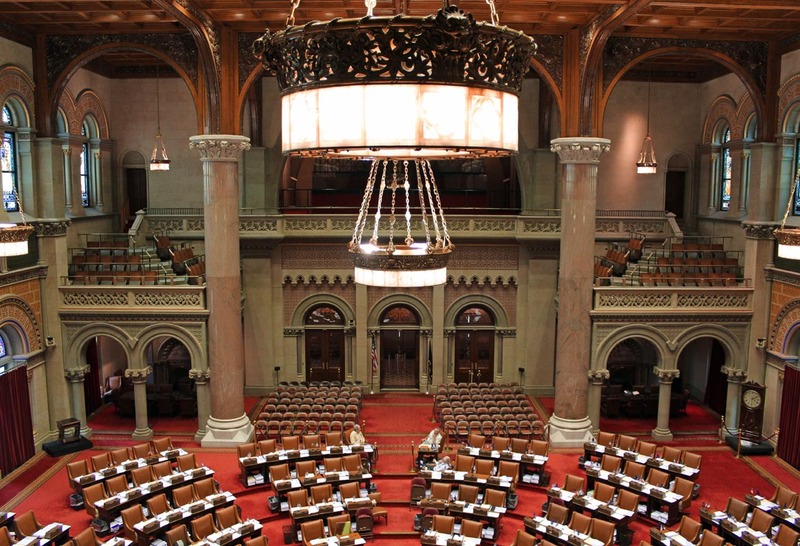 I remember that at one time the Assembly's carpet was an awful green color. It has thankfully been replaced with a more dignified red. Ken and Lewis confer, converse, and otherwise hob-nob in the Great Western Staircase. The whole building has been under renovation for the past few years, but that seems to be winding down now. I did get lost inside a time or two, but I don't think anyone minded too much. 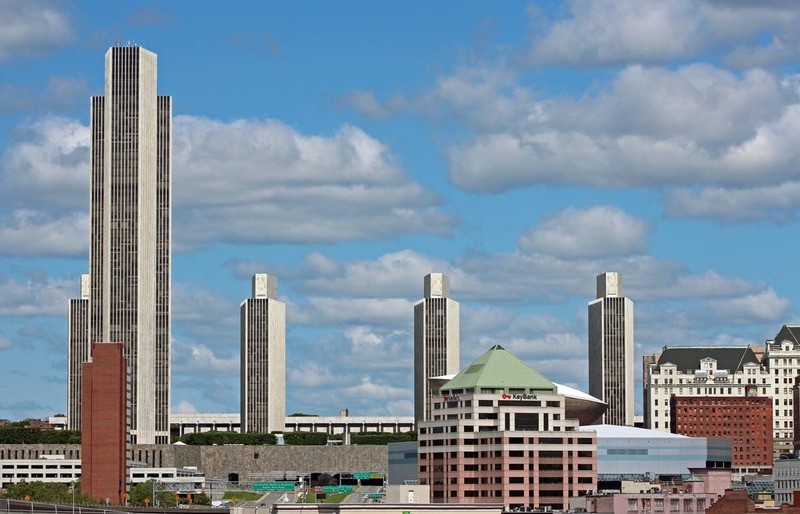 We made our way out on the south side of the building onto the vast Empire State Plaza. When I used to vacation in Europe (and even now that I live here), I always found myself visiting some chapel, church, or cathedral. Even though they start to resemble each other after a while, it's still fun to go inside to see what they look like. The façade of St. Peter's. The tall bell tower is not part of the church; that's Albany City Hall. So why not do the same thing when I'm traveling around in North America? Granted, the churches aren't as old, but they're still interesting. Of course, more and more churches get locked up to prevent vandalism, so you can't always go inside. On this trip we did get inside to see three churches. Three's a good number. 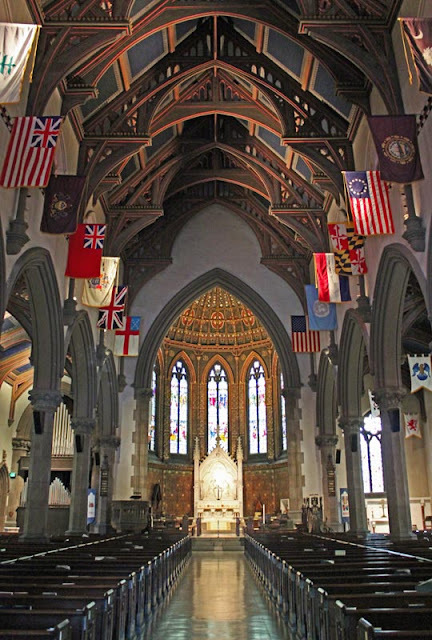 This first one is Saint Peter's Episcopal church on State Street in downtown Albany. The current building dates from 1859. I've passed by this building all my life without ever taking notice of it. Until recently. While walking after lunch a couple of weeks ago we noticed that the doors were open, so we went in to have a look. It's even more amazing on the inside than it is on the outside. 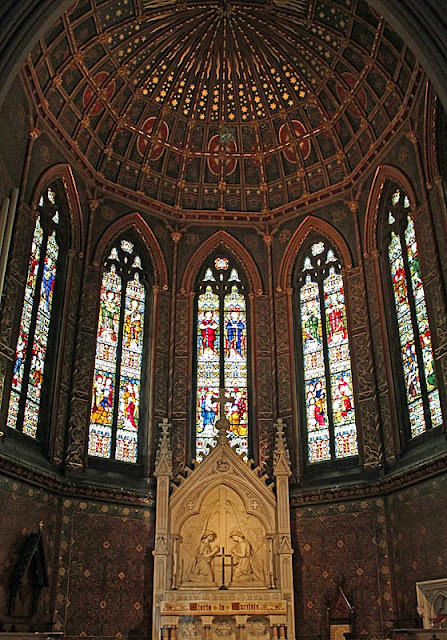 The architectural style is French decorated Gothic. While we were inside, the organist was practicing, so we got to hear snippets of whatever it was he was playing on the impressive pipe organ. Very churchy. I was amazed by the brightly painted timber-framed vaulted ceiling. 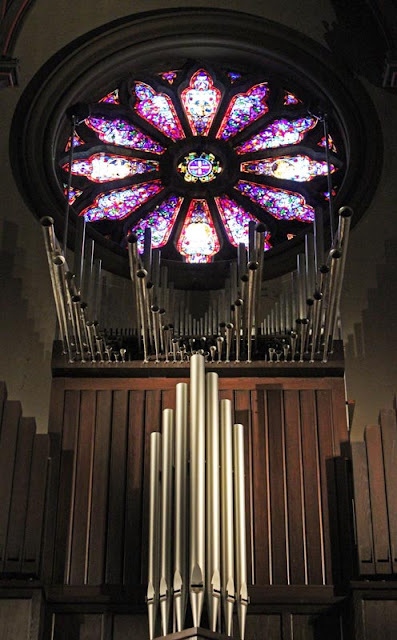 The rose window and organ pipes. Ken, Evelyn, Lewis, and I walked around inside for about fifteen minutes taking photos. As I'm sure I'll remind you often in the coming weeks, I was using my new camera and still learning how it works, especially in different lighting situations. All these shots are hand-held (no tripod) in low light, so they're a bit fuzzy, but they still give you the idea. 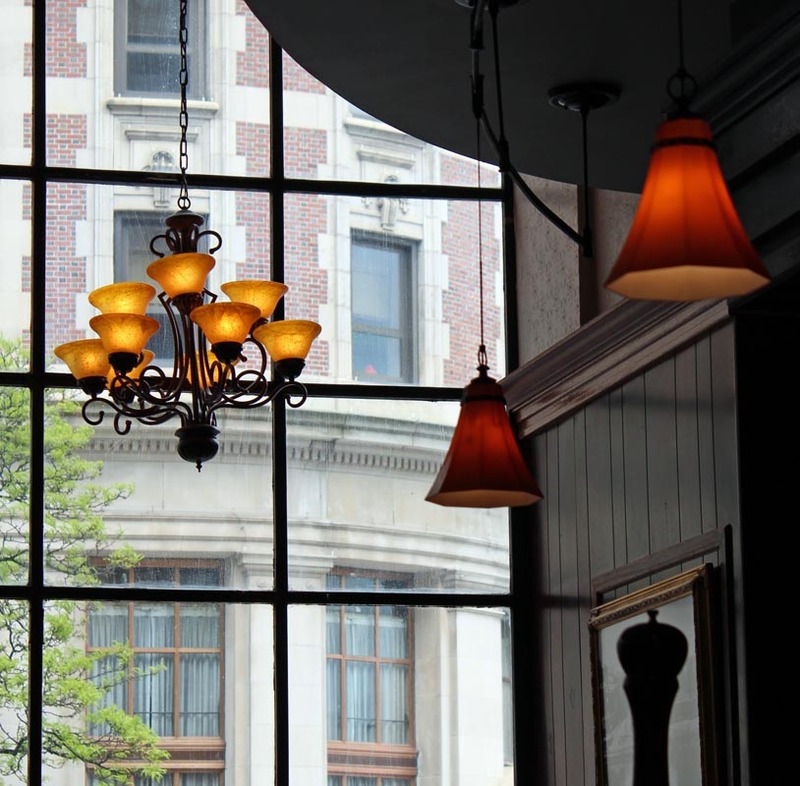 Jack's Oyster House is an Albany institution. Opened in 1913, the restaurant has been in continuous operation since, meaning that it's open seven days a week, three hundred sixty-five days a year. In nearly ninety years, the restaurant has only closed its doors once: for the funeral of its founder Jack Rosenstein in 1987. 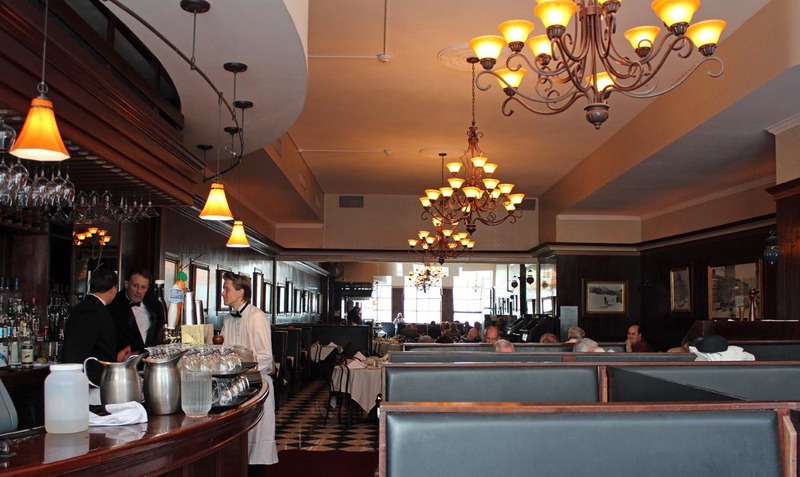 The main dining room at Jack's. When looking for a place to have lunch after our wedding, Ken and I decided that Jack's would be just right. And it was. I had been to Jack's a couple of times for events, but never to actually sit down and eat a meal. We enjoyed a convivial lunch with Lorraine, Lou, Evelyn, Lewis, Pat, and Richard. Our waiter John treated us very well. The downtown setting. You can see Jack's sign on the right. Many of us ordered broiled scrod for the main course and it was delicious. The calf's liver got Ken's attention and he had that. My Aunt Kathy told us later that Jack's had always been famous for their liver. I took photos of all of us at the table, but I don't like the way they turned out, so I won't post them. The view through Jack's window on State Street. 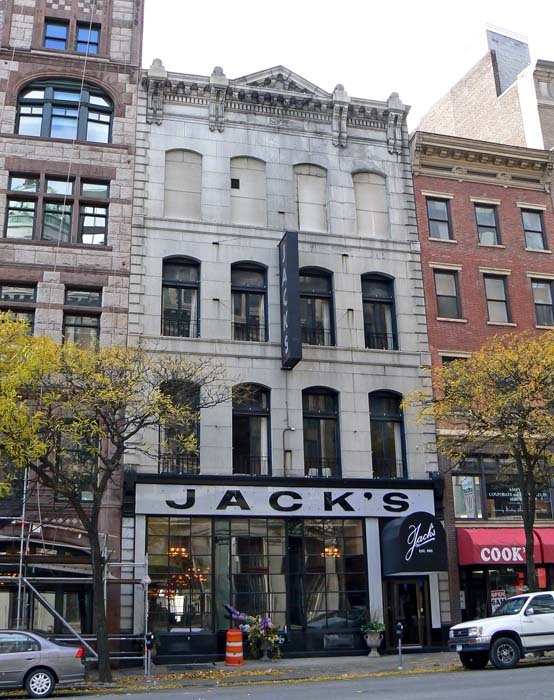 Here's an exterior shot of Jack's that I took in 2009. Thursday, May 10, 2012. We picked the day months in advance, only to find out that City Hall only performs marriages on Saturdays, Mondays, Tuesdays, and Wednesdays. While I considered solutions to this problem, my friend Lorraine told me that her friend Pat could perform the ceremony and she put us in touch with one another. Pat graciously agreed to officiate and we were back on track. Ken looks nervous (second thoughts?) and I'm directing traffic, as usual. Through the miracle of e-mail, Pat and I discussed the what the ceremony should be like and where we'd have it. Like I said, I originally thought we'd be doing this in City Hall, but now the options were wide open. 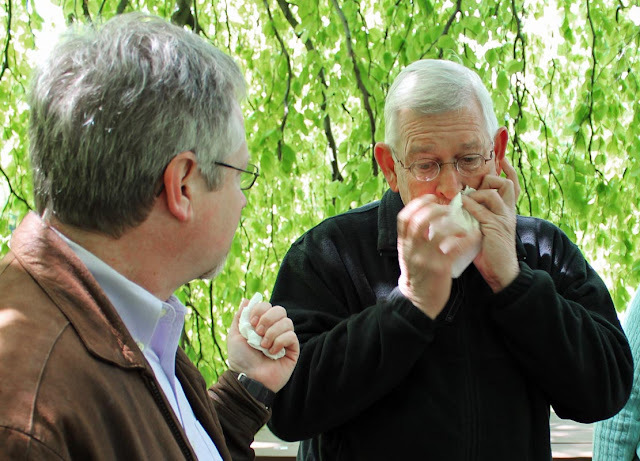 I liked the idea of being married in Albany's Washington Park among the May tulips, so that's what we decided to do. As Thursday approached, the weather forecast got iffy. Ken and I went to the park on Wednesday to scope out a location and to see if we could find a sheltered spot in case of rain. The park's lake house has some covered arcades that would serve, so we felt good about that. I took a whole bunch of photos of the lake house and the tulips that day, and then some photos of our pizza dinner that night, but somehow I lost them. Something to do with the new camera, transferring pictures from the card to the laptop, being jet-lagged and excited about the wedding. Oh well. I always cry at weddings. Please pass the kleenex. On Thursday at eleven-thirty, we all met in the park at our predetermined rendez-vous point: the statue of Moses among the tulips. The weather stayed dry, but there was a bit of gusty wind. Pat's husband Richard suggested we hold the ceremony in the shelter of a nearby large weeping cherry tree. 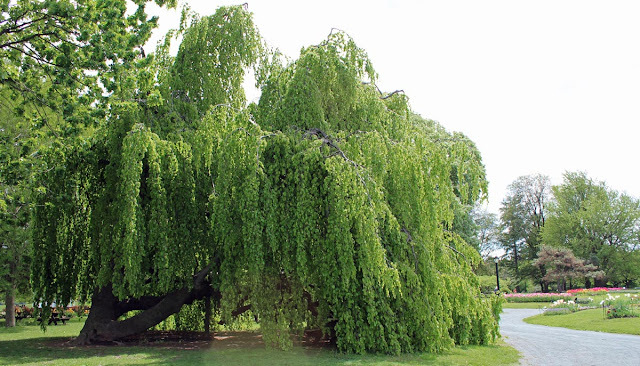 It was the perfect spot; in fact, Richard told us that many people get married under that tree and that he's heard it called "the wedding tree." The wedding tree. You can see the tulip beds in the background on the right. After a little milling about, we got down to business. Pat was wonderful. After about fifteen minutes, we were married. In addition to Pat and Richard, we were joined by my very dear friends Lorraine and Lou (who are indirectly responsible for me meeting Ken over thirty years ago), and some relatively new friends (whom we met because of blogging) Evelyn and Lewis. 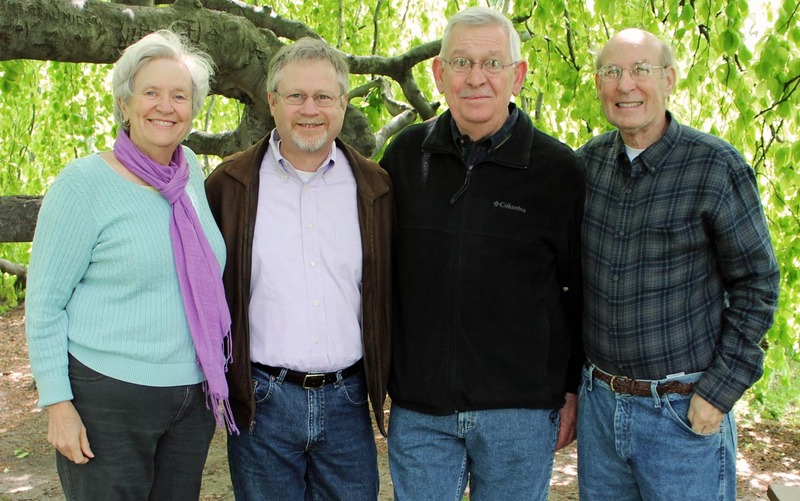 We are so very grateful for their support and for standing up for us on our special day. Ken, Lou, Walt, and Lorraine. 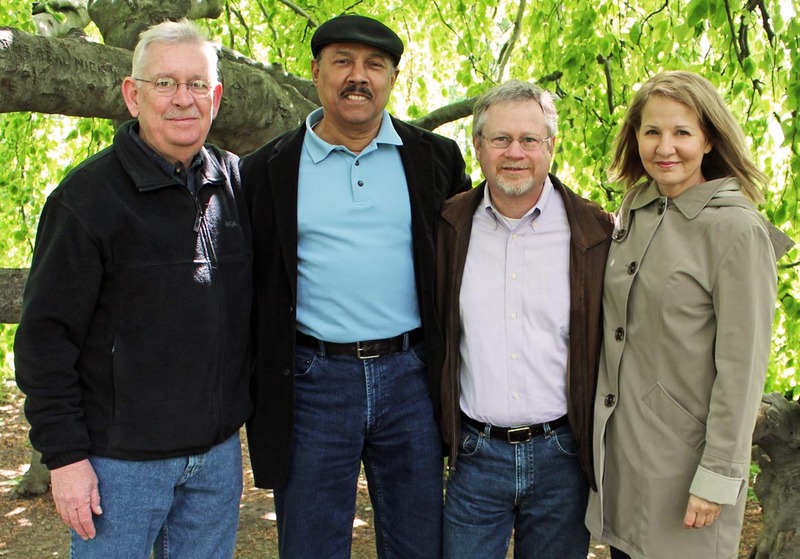 Evelyn, Walt, Ken, and Lewis. After the ceremony, we convened for lunch at a famous downtown restaurant called Jack's. The first order of business was a bottle of champagne, of course. After lunch, Ken and I took Evelyn and Lewis on a little walking tour of downtown. It was a great way to spend some time with them and to walk off a little of the food and wine. Lorraine, Evelyn, and Lewis did a terrific job with the cameras to record our little ceremony. Lewis even took some video. These are some of their photos. By the time you're close enough to read this sign, it's too late. If the traffic exiting the freeway at speed hasn't given you your first clue, the sign will take care of it. I have no idea why I took the picture. It must have been the lines. Or something. Why is the sign at "half mast?" We had some other errands to run on Monday afternoon, then dinner with our hosts, Lorraine and Lou. Lorraine made a big salad and we added some sliced turkey breast which was left over from our wings feast on Sunday (I forgot to tell you about that. And, there were sweet potatoes!). 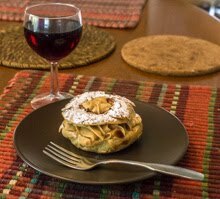 We enjoyed the food while watching Woody Allen's "Midnight in Paris," which Lorraine and Lou had recorded for us. We couldn't have asked for a better evening! The Livingston Avenue railroad bridge over the Hudson River at Albany. The center section (left) swings to let tall boats through. On Tuesday, the weather changed and it rained. That didn't pose any real problem. I had an eye exam first thing that morning and ordered some new glasses. After that, we went shopping for jeans and other clothes that are much more economical for us to buy in the US than in France. Lunch was more Buffalo-style chicken wings at another wings joint in a shopping center. We ran from store to store in the pouring rain, but we had fun and found some good bargains. After our dinner in Kittery, Maine (our third state, just over the border from Portsmouth, NH), Bob drove us back to the Boston suburbs; I think I slept in the car. The next day he took us out for a nice American breakfast at Julie's Place in Acton. Eggs, hash browns, coffee, yum. We rode around a bit looking at some local sights before heading back to the house to pack up the car. While we packed up, Bob's wife Norma called from Florida and we had a nice conversation on the speaker phone; the next best thing to being there. We watched CNN just long enough to see that François Hollande was elected president of France, then bid our farewells to Bob and headed west to Albany, New York (our fourth state). It was a beautiful three-hour drive through the Berkshires. We got to our friends' house outside of Albany around five o'clock. After our hellos and some catching up, we ordered some take-out Buffalo style chicken wings for dinner and settled in. 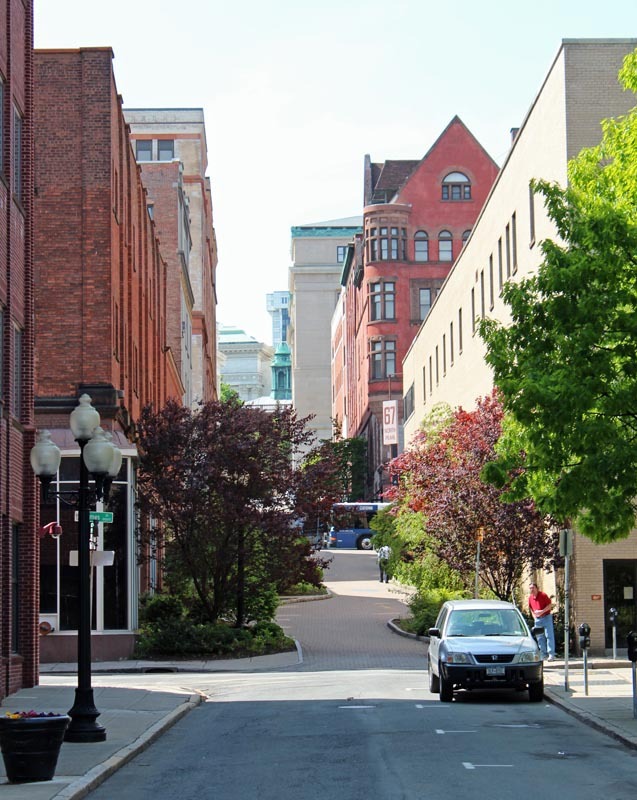 Pearl Street in downtown Albany, looking south. The next day was Monday and we had a mission: to get our marriage license. Ken and I went downtown to City Hall and applied. 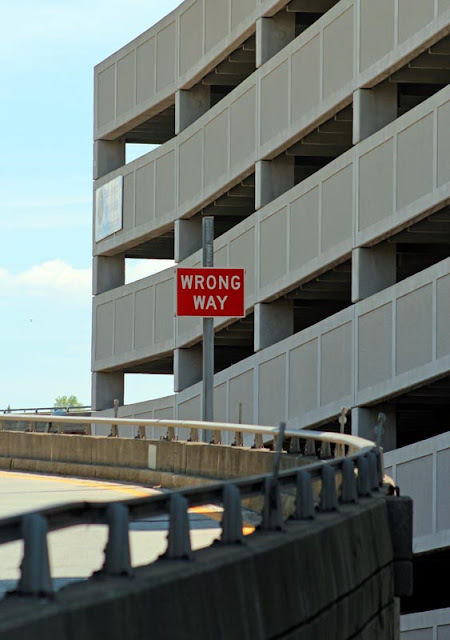 We had all the papers we needed and, although one set of papers raised more questions than it should have, the kinks were ironed out and we left with our license. We met our friend and host Lorraine for a terrific downtown lunch. Ken and I had juicy hamburgers, Lorraine was very good and had a salad. 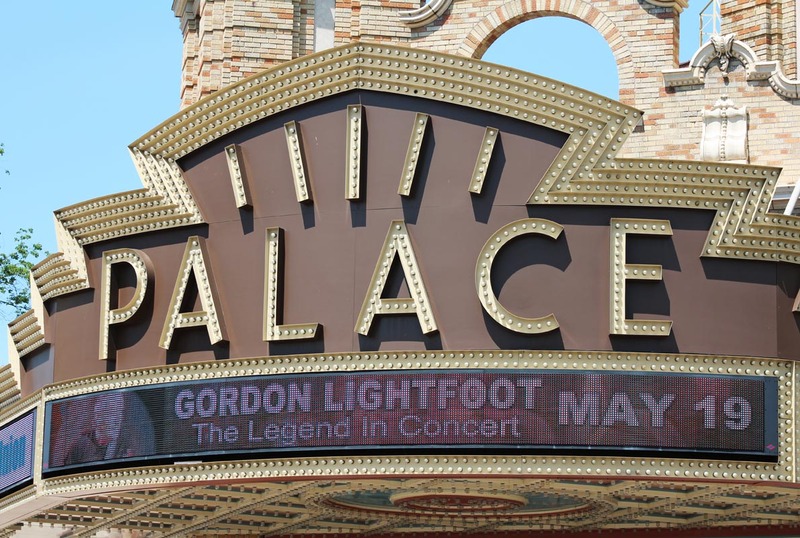 The Palace Theater marquis downtown. He still does concerts? After lunch, Ken and I walked around downtown a little, soaking up the sun and enjoying stretching our legs. And we took pictures. 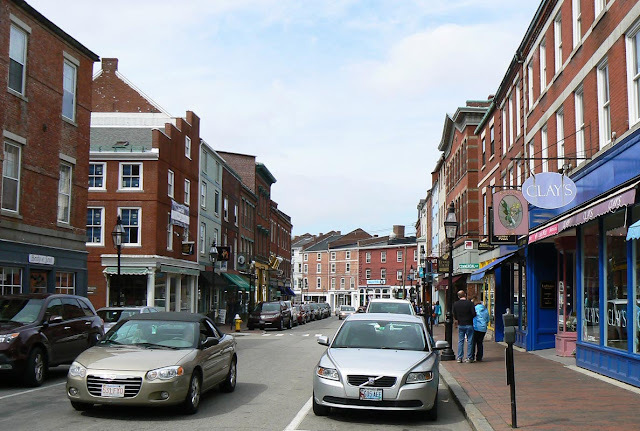 We left Rockport and Bob drove us further up the coast to another lovely port town: Portsmouth, New Hampshire. Our second state in two days. The downtown section feels more urban than Rockport and it is just as charming. The building stock is well preserved and the town is lively and animated. Of course, it was Saturday afternoon and the sun was shining brightly. That helped a lot, I'm sure. Market Street in downtown Portsmouth, New Hampshire. Bob told us that, among other things, Portsmouth was famous for its micro breweries. 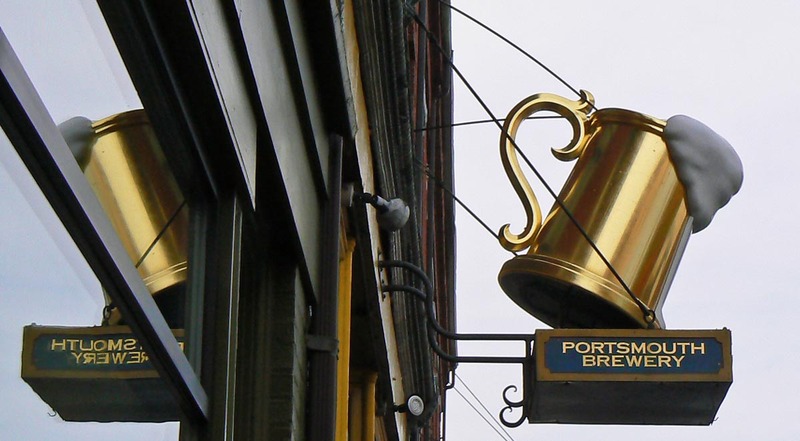 We headed for the Portsmouth Brewery on Market Street to taste some of the local beer. The main restaurant and bar was filled to the brim, so we ducked downstairs to the smaller bar where we found a few empty stools and ordered a few half-pints and a small plate of appetizers. The sign outside the Portsmouth Brewery. Great beer! The beer and the food were great, but what happened next was even better. Without thinking about it, I was wearing a baseball cap. A New York Yankees baseball cap that I've had for years. And, while it hadn't occurred to me, I was wearing it in Boston Red Sox territory. Uh-oh. The bar manager, a young and rather burly guy, noticed and said, "You've got a lot of courage to wear that in here." I thought I was in serious trouble. He wouldn't hit an old guy in glasses, would he? "Well," I said, "I'm from upstate New York." As if that would somehow make everything all right. "I didn't even realize I was wearing it." "It's ok," the manager replied, "I'm a New Yorker, too, from down in the Hudson Valley." We were practically neighbors. "And just for that," he continued, "I'm going to comp your beer." I cracked back, "And then you'll probably throw it in my face." Smiles all around. The manager laughed and disappeared into the back room. We didn't see him again. But when the bill came, all three of our beers were free. We paid for the food and gave the waitress a very nice tip. The undisputed star of the seafood platter on the New England coast is the lobster. You see them on nearly every menu and in nearly every market. Their price is variable, depending on the season and the fishing conditions, and it changes almost daily. Lobster pots piled up on a wharf in Rockport Harbor. The red fishing shack at the end is called "Motif No. 1" and is touted as the most often painted building in America. I didn't know that when I took the picture. Rockport is one of the many coastal towns with a history of fishing and lobster trapping. To catch lobster, baited cages (called "pots") are lowered to the sea floor, their locations marked with buoys. The lobsters wander in but can't get out. Fishermen haul the cages up to their boats and remove the lobsters. As with most fishing, there are strict rules about how many and what size lobsters can be kept. 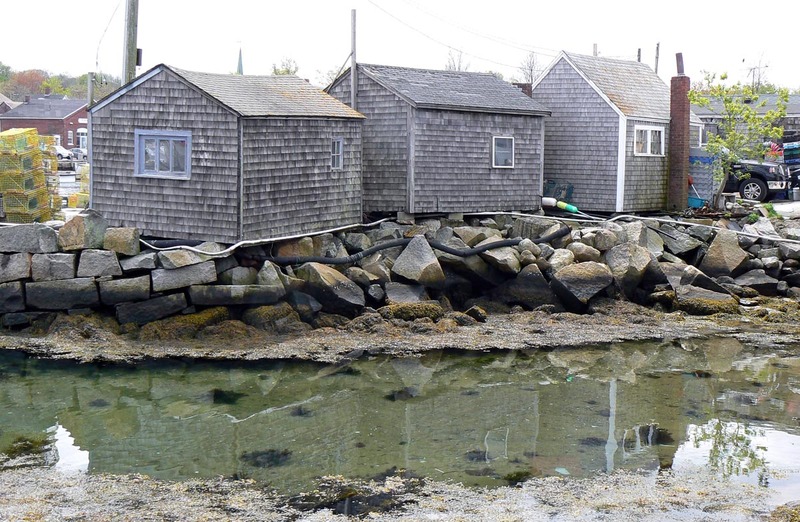 Fishing shacks on the water's edge in Rockport. I ate lobster only once on this trip. It was in Kittery, Maine, just over the boarder from New Hampshire. Ken had a plate of claws and I ate a lobster roll, a salad of lobster meat made with mayonnaise and served on a bun. Delicious! Our stay in the US began in the Boston suburbs. One of Ken's friends from graduate school and his wife came to visit us in France last September. While here, Bob and Norma kindly invited us to visit them when we traveled in the Northeast, and we took them up on the offer! Our only disappointment was that Norma had to be out of town when we arrived. Still, she baked a cake and a loaf of banana bread that we enjoyed in her absence. The buildings on Bearskin Neck in Rockport back right up to the water. Bob surprised us with grilled steaks on our arrival that Friday evening. We nibbled on cheese and crackers with some wine, then devoured Bob's expertly grilled steaks with baked potatoes and green salad. And more wine. We retired to bed around midnight after a terrific evening of fine food and story telling. The next day, Bob suggested a drive up the coast north of Boston. We drove through Gloucester, making a pit stop at a local Walgreens, before arriving in the historic fishing village of Rockport. We parked the car and had a nice lunch at the Blue Lobster Grille, after which we strolled along Bearskin Neck, a bit of real estate that juts out into Sandy Bay. Now that we're home, I can say with total certainty that this trip was a momentous one for us. Ken and I got married, legally, in New York. A new president (and one more aligned with our politics) was elected in France. President Obama visited Albany while we were there, and the next day pronounced his support for marriage equality. We spent time with old friends, family, and blogger buddies. 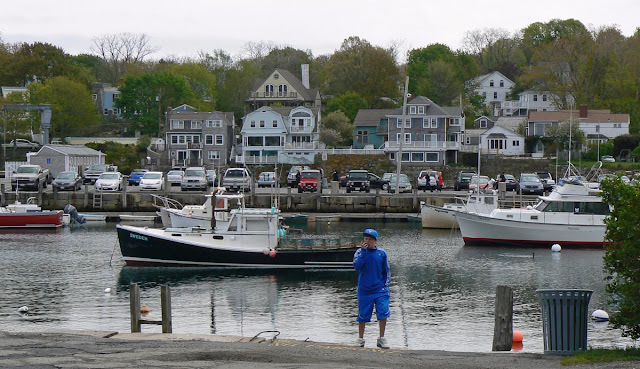 A kid in blue on the harbor in Rockport, Massachusetts, 5 May 2012. I kept marveling toward the end of our stay how all of our plans went smoothly. The glitches were few and unimportant. I'd like to chalk it up as a testament to my planning skills, but I know a little luck was involved. So, for the next bunch of blog posts, I'm going to go back and share some of the photos and stories from our two weeks in the northeastern U.S. and Canada. We visited five states and two countries, albeit some of them very briefly. I'm getting a late start this morning. We traveled for about 26 hours all told. The flight was good, even though it was a little bumpy during the dinner service. It smoothed out and I actually slept for a few hours. We arrived early in Paris and our bags were among the first to show up on the belt. This was the view from my window seat as we pushed back from the gate at Logan Airport in Boston. We planned plenty of time between landing and our train home, so we had a lot of time to kill in the airport. When the restaurants opened, Ken and I had a nice steak for lunch. The train rides were quick and we arrived home on schedule. As we got off the train, rain was pouring down buckets. It was great to see home again. Callie and Bertie are in great shape and we're very appreciative for our friend S. who stayed here with them. Now we need to readjust to France time. We both slept for about ten hours overnight, which is good. If everything goes according to plan, by the time this posts, we will be on the ground in Paris. I was still in Hyannis, Massachusetts, when I typed this. On Friday night, we drove up to Provincetown at the tip of Cape Cod for a walk and dinner. 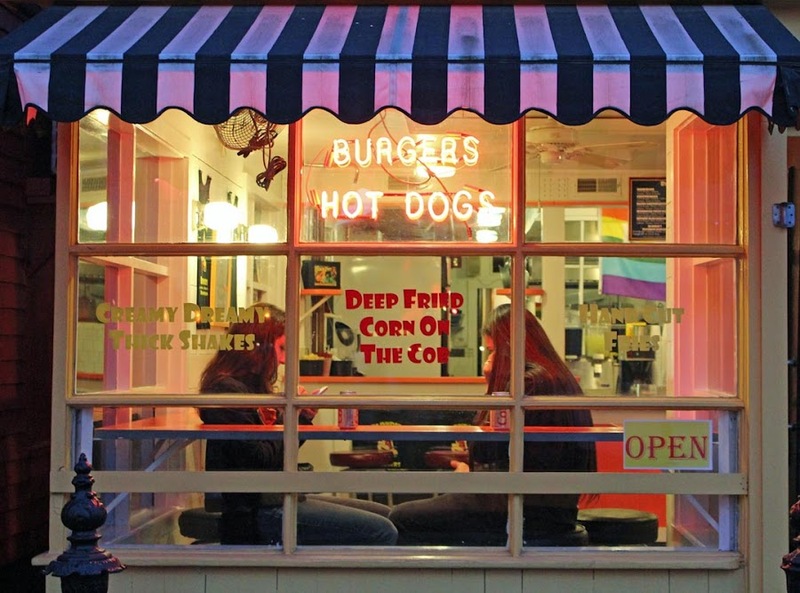 An American burger joint in Provincetown on Cape Cod. Dinner was modest, a couple of pizzas and some wine. For some reason, we were a little tired. But we enjoyed walking through town and seeing the sights. Now we're waiting for our train south to home. It'll be nice to get home, see the animules, and unpack. 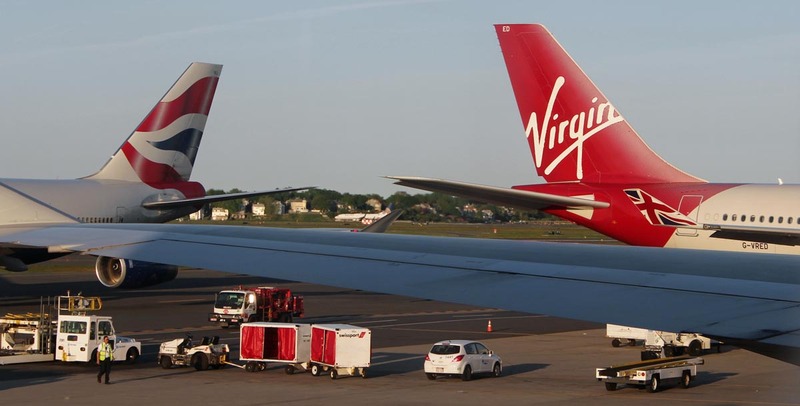 Today we will board our jetliner in Boston and head back to France. 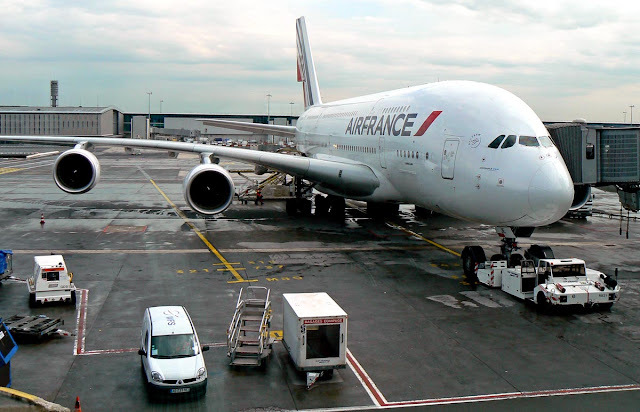 It's an overnight flight, and we'll touch down in Paris around 8:30 a.m. local time (2:30 a.m. Albany time) on Sunday. It's been a great two weeks full of fun, friends, family, and adventure. State office buildings in downtown Albany, New York. As we get back into our home routine, I'll be posting more photos from our trip. Stay tuned! 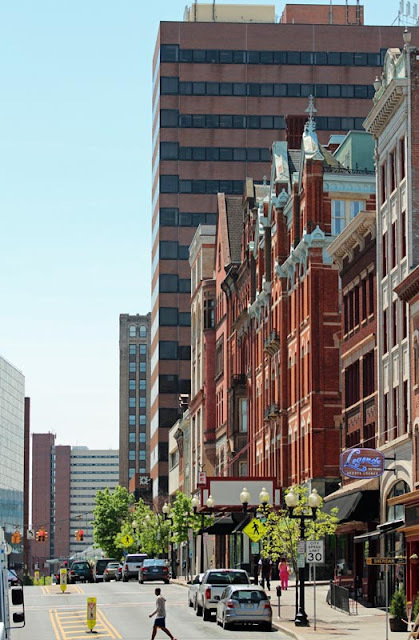 We're leaving Albany today and heading out to Cape Cod for a night before flying out of Boston on Saturday. Ken and I decided we'd like to have dinner out in Provincetown since neither of us has been there before. We'll be staying in the mid-cape area and that will make our drive to the airport a little easier on Saturday. A glorious Saturday morning in the park above downtown Montréal. In the meantime, here's another shot of the Montréal skyline seen from the overlook on the Mont Royal. The tulips were in fine form this far north. I'll have some more photos from Montréal and the rest of our northeastern adventures in the days to come. Some of you have. Many of you might have guessed. The primary purpose of our trip to New York State this year was to get married. Today is our one week anniversary, having got married last Thursday in Albany's Washington Park. The newlyweds! 10 May 2012. Our ceremony was brief but very nice. We are more than grateful for our friends Lorraine, Lou, Evelyn, and Lewis who were on hand to support us. 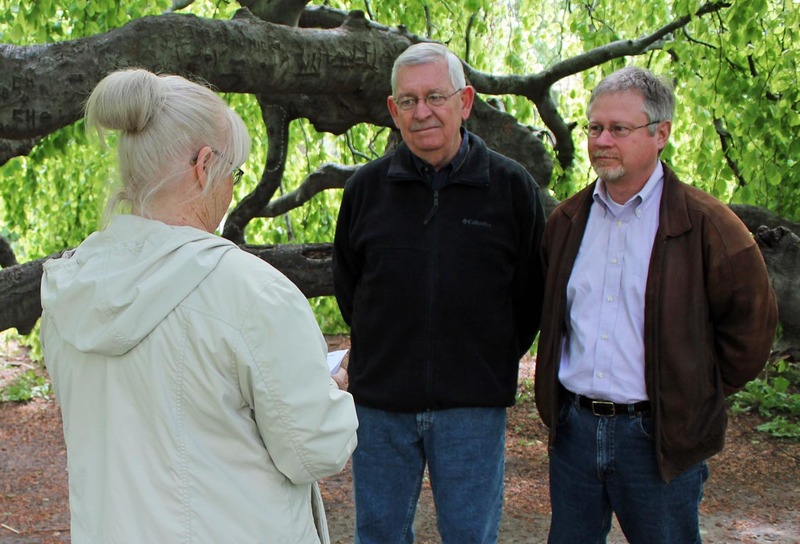 Special thanks go to Pat, who officiated, and her husband Richard, who also attended. After our ceremony in the park, we enjoyed a nice lunch at Jack's Oyster House downtown. We didn't announce this in advance because we wanted to be sure we had everything we needed to get the license. In fact, there was a minor glitch, but the ladies in City Hall went the extra mile to make sure we got our license. And we didn't want to blog about it until we could share the news with our families. So, it's official. 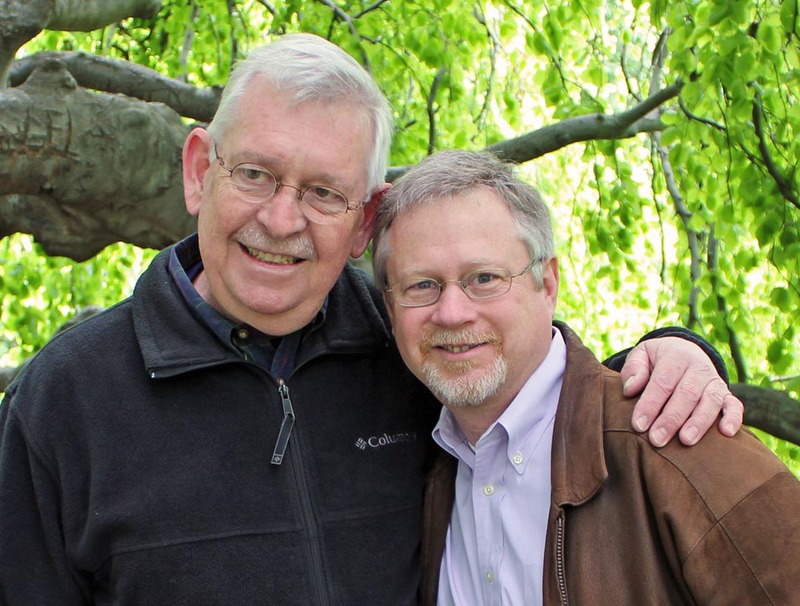 After a thirty year engagement, Ken and I finally tied the knot. I wish I could say I was on that boat, but I only watched it from the Vermont shore. This view is toward the west, looking at New York State and the Adirondack Mountains. 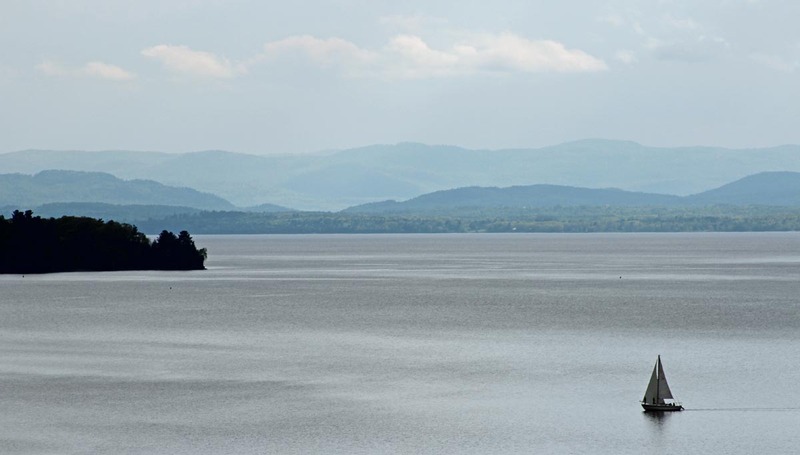 The lake is the border between northern New York and Vermont. While it wasn't a brilliant sunny day, there were gaps in the clouds that allowed a little of the sun to come through. The sailboat glided slowly over the nearly glassy surface of the lake. The weather back is Albany is also overcast now. We're hoping for a little sun starting today through the end of the week, if the forecast holds. While here in Delmar, I've been taking morning walks to get some exercise in an attempt to counter all the food we've been eating. The rhododendrons have just bloomed all over the neighborhood and they're beautiful. Ken and I drove down the western edge of Vermont today from Burlington back to Albany. We had a good lunch in Bennington, VT, before heading into New York State. Our weekend in Montréal was a great success. 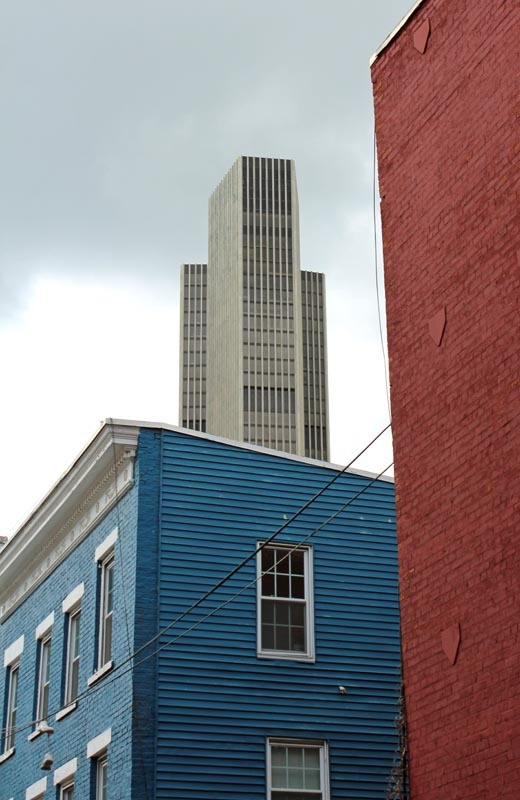 Corning Tower in Albany rising up behind some colorful townhouses. This week we'll be seeing some of my family. We'll also be preparing for the return trip next weekend by doing a "trial pack" to see if we can fit everything into the suitcases. Wish us luck! We left Montréal yesterday under rainy skies, but while we were there we enjoyed terrific sunshine and the warmth of the city. The place has changed considerably since I was last here nearly twenty-five years ago. We landed (quite unintentionally) in a great neighborhood very close to many amazing attractions, not the least of which is the rue Saint-Denis, a bustling street filled with night spots and restaurants. A view of springtime in downtown Montréal from the heights. Click to Québec-enate. Since the weather was so good, the streets of the city were bursting with people enjoying the sunshine. Everybody was in a good mood and the cafés were full. We ventured out of the downtown into some of the eastern neighborhoods and found beautiful architecture (many churches) and a fantastic market filled with amazing produce and other delicious-looking stuff. I'll post more about all of that later. We spent last night near Burlington, Vermont, and today we'll be making our way back to Albany. It's Sunday and we will be leaving Montréal this morning and heading down toward Lake Champlain and Vermont. We're planning to spend the night in Burlington, Vermont, before heading back to Albany on Monday. The church was open for praying, but not for tourists, so we didn't go inside. 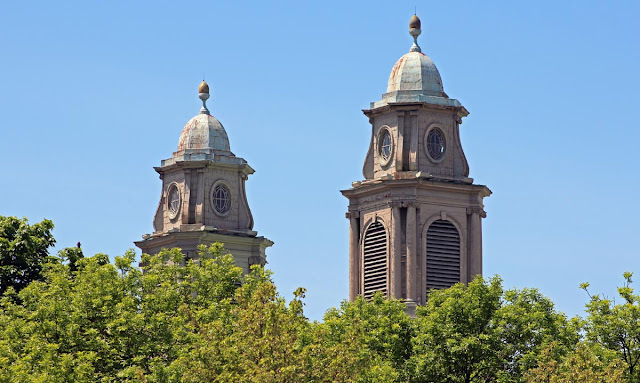 This photo shows the twin spires of the First Reformed Church in downtown Albany. The building went up in 1798, but the congregation was established over 150 years earlier (1642) to serve the Dutch settlers in the trading post that would later become Albany. That's the name of this little lane that runs up Capitol Hill from down by the river on Broadway. The pretty red building on the right side of the photo was restored back in the early eighties as the Steuben Athletic Club, a high end gym. Steuben Street with the Athletic Club on the right. The weather changed on Friday. The winds picked up and the rain moved off to the east. But the wind kicked up and the temperatures dropped a little. On Friday I went for my morning walk and it was 47º, but the sun was out and the wind was still. It was very pleasant, even invigorating. 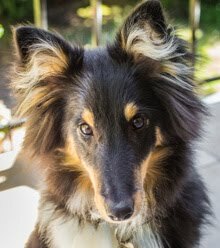 I saw three or four beautiful dogs being walked in the neighborhood. Also on Friday, we drove from Albany up to Montréal for the weekend. Since I wrote this post in advance, I'll have more about that later. ...sometime. While Monday was a brilliantly sunny day, the days since have been overcast and wet. No matter, we've spent the time going to store to restaurant to store, getting our shopping and eating done. Don't get the wrong idea, this is not huge shopping we're talking about, just some little things that we like that we can't get back in France and a few clothing items. 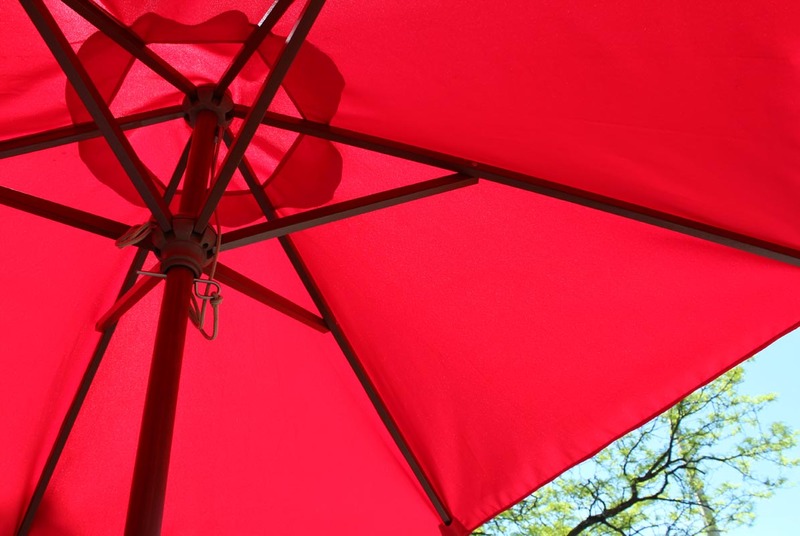 Sitting under a red umbrella, having a glass of wine in downtown Albany on Monday. French jeans are very expensive, so we find good bargains here. And we found some sneakers on sale for much less money than we would have spent at home. Ken and I each got a new camera -- we had ordered them from Amazon prior to the trip -- and we're enjoying learning how to use them. Last night some friends from Alabama came to town. They are traveling in the Northeast and decided to swing through Albany while we are here. We, they, and the friends we are staying with went out to a tavern out in Voorheesville for dinner Wednesday night. Smitty's (it's actually called Smith's Tavern) has been around since 1945, but there's been a restaurant on the site since 1901. They started serving their famous pizza in 1959. We had a great time, until they turned the volume way up on the jukebox and the country music started blaring. 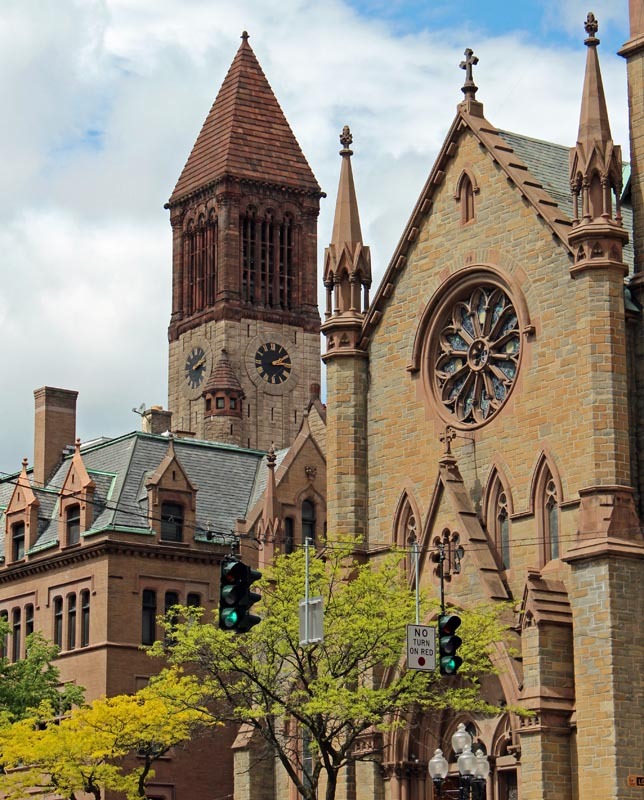 Ok, we've been in Albany since Sunday afternoon, so I think I'll stop posting pictures of Massachusetts for the time being and switch to pictures of Albany. There are a few more photos from MA and NH that I'll put up when we get back home in a couple of weeks. 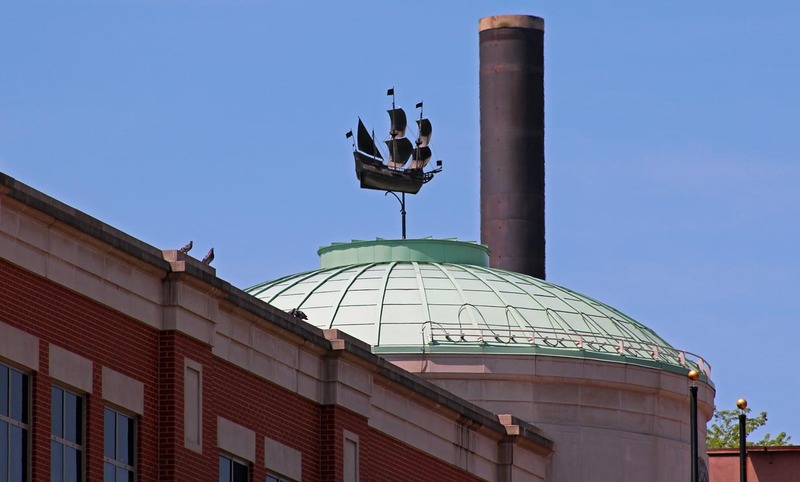 The relatively new Albany Family Court building, and an old smoke stack rising up behind. On Monday, we had some errands to run downtown and walked around a little in the beautiful weather taking pictures before meeting our friend Lorraine for lunch. This is the dome on the Albany Family Court building. The weather vane on top is a depiction of the Half Moon (I think), the ship that Henry Hudson sailed up the river that bears his name. Over four hundred years ago. Tuesday was a rainy day, but a productive one. I got my eyes examined and ordered three pairs of new glasses. I will be able to see clearly now. My old prescription was too old. We also did a bit of shopping that we wanted to do. And we successfully avoided the road closures surrounding President Obama's visit to Albany. I think the buoys were lobster pot markers. Now they're decorating this courtyard. 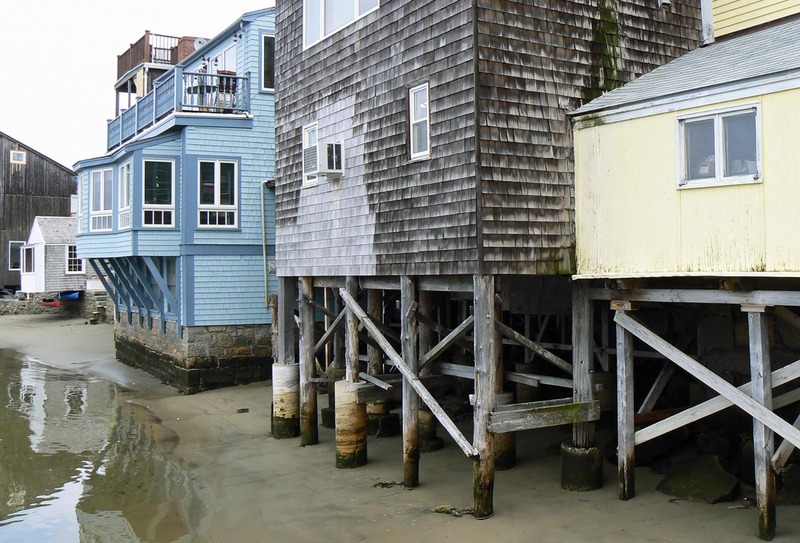 Photographically speaking, we're still looking at pictures from Rockport, Massachusetts. 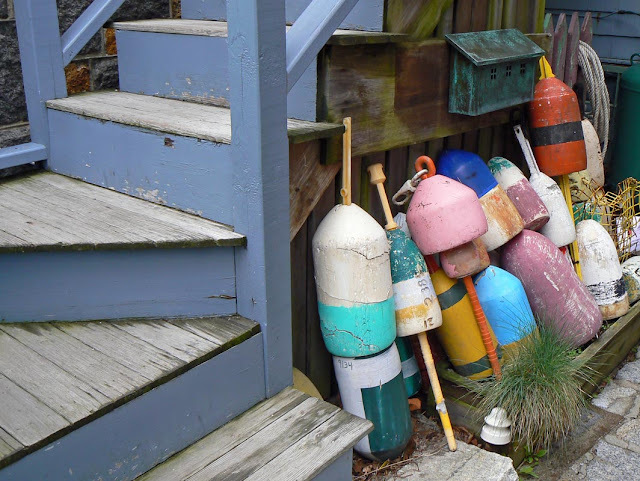 These are a bunch of old buoys leaning up against a colorful stairway. 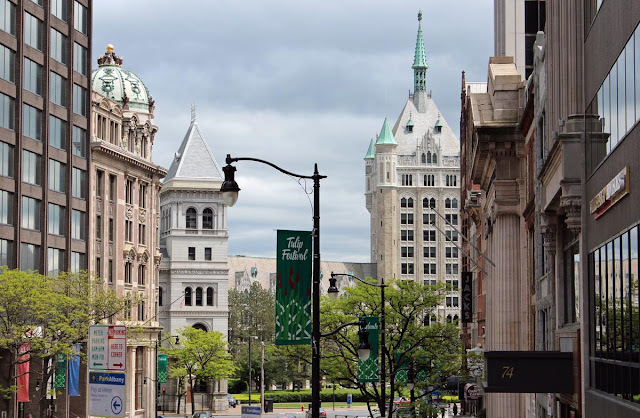 Tonight we're heading out to dinner with a fellow blogger, his husband, and fellow Facebook friends in Troy, NY, just up the Hudson River from Albany. We're looking forward to seeing them all! This coming weekend in Albany, NY, is the annual tulip festival. 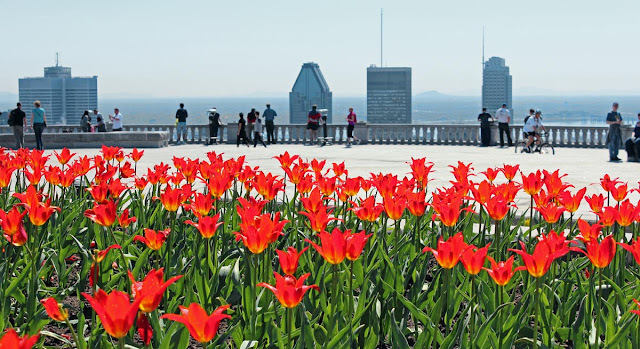 The city, founded as a Dutch settlement and trading post by Henry Hudson in 1609, celebrates its Dutch heritage every May when the thousands of tulips planted in city parks bloom. With this year's very early spring, however, the tulips have come and gone in advance of the festival. 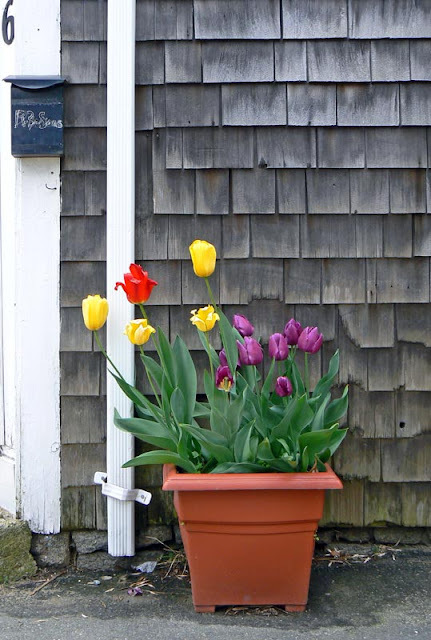 These tulips in a planter box are not in Albany, but in Rockport, Massachusetts. Oh well. Stuff happens. We won't be here for the festival in any case as we're heading up to Montréal for the weekend (more about that later). For now we're running around doing some shopping, eating some food, seeing some friends, taking some pictures, and generally having a good time. Today I'm going in for an eye exam and some new, updated glasses that I sorely need. We didn't eat here, even though the sign asked us to. But we were tempted. 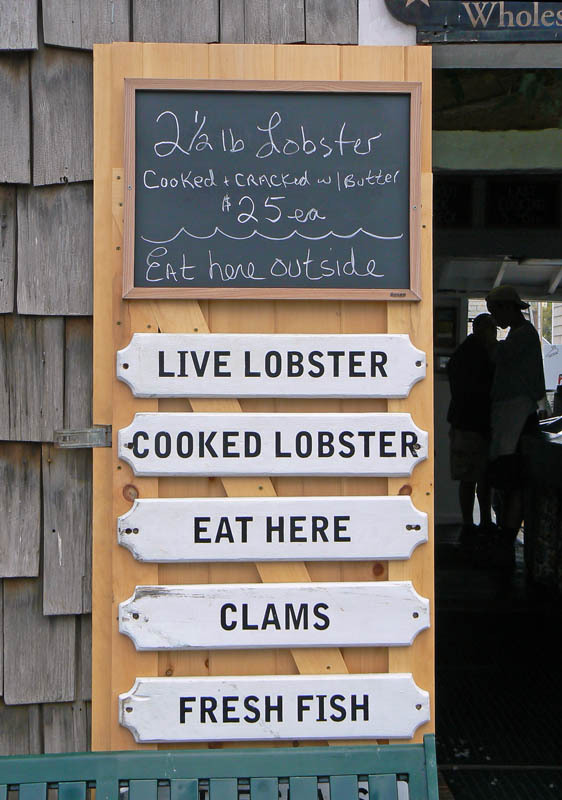 Lobster and other seafood are the specialties of these New England seaport towns. That, and art galleries and souvenir shops. The setting is beautiful. We left Massachusetts on Sunday afternoon right after learning that François Hollande was elected president of France. I think that's very cool and am looking forward to how his government will unfold. It will be a very interesting month as the transition happens. Then, in June, the parliamentary elections will happen and we'll see if the Socialists can take the majority there. If not, they'll have to try to cooperate with a hostile assembly. Stay tuned. It's funny. Yesterday, the day we arrived in the US, we stayed up until midnight talking and laughing and eating. Today, it's not yet nine pm and I'm fading fast. We had a great time with our friend Bob today. We drove up into New Hampshire and as far as southern Maine, where we had a nice seafood dinner. 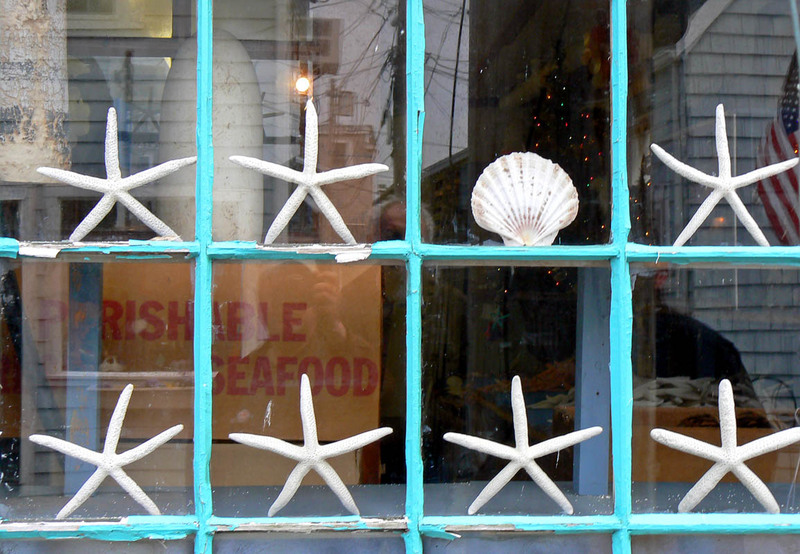 A shop window in Rockport, Massachusetts. I had fried calamari and a lobster roll. Yummy. On the way back to the Boston suburbs, Bob drove us through a neighboring town where my family lived when I was about ten or eleven years old. I remembered the name of the road we lived on and a landmark or two, and with very little effort we found the house. We leave tomorrow to drive west through the Berkshires to the Hudson Valley and Albany. The weather is supposed to be nice and I'm looking forward to the drive. We took trains and planes and automobiles. As I type this, I'm realizing that I've been up for twenty-four hours and have had at least four lunches. And a fantastic dinner. But we are very tired and will be heading to bed very soon. This is the plane we flew on. We were in the very back. The picture above is our plane. 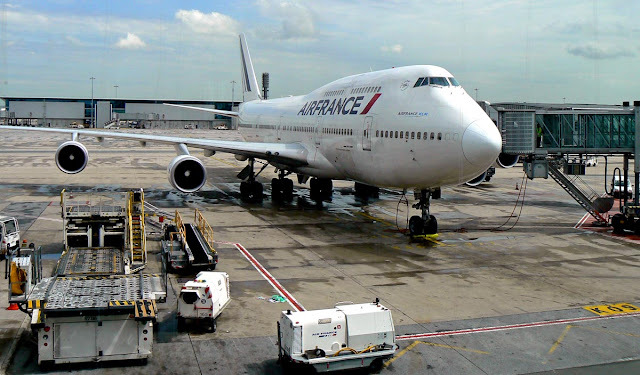 We took off from Paris on Friday afternoon in a half-empty Boeing 747. We each had a row to ourselves and enjoyed an extremely comfortable flight. I wish they could all be like that. The other photo is of an Airbus A380, the new double decker. Wow, what a plane. It would have been fun to be on one of those, but it was not to be this time.